The aisles of your local gear shop are full of strange words like “vegan leather,” “Fair Trade Certified™” and “BPA-free.” These words clearly have something to do with sustainability and saving the planet, but do you know what they really mean? Here we offer a guide to the words, phrases, certifications and organizations making up the expanding lexicon of the world’s environmental awakening. 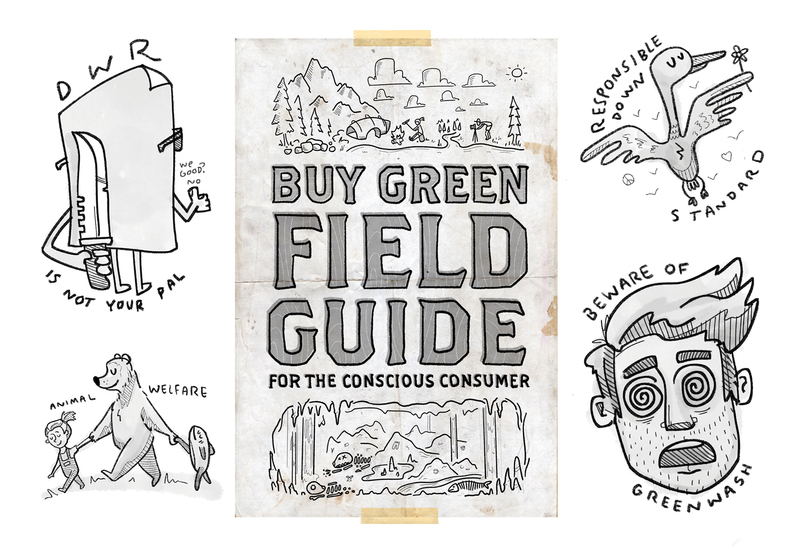 Learn them and you’ll become a bonafide expert in buying green. An international coalition of businesses, nonprofits and individuals donating at least 1 percent of sales or salary to environmental causes. Since 2002, 1% for the Planet has pumped more than $175 million back into the environment. Outdoor brands view the little blue logo as a badge of honor and you should, too. An extremely effective empty and often meaningless label marketers use to sell you things like veggie bacon and biodegradable soap. The belief animals shouldn’t suffer at the hand of humans. If you buy a product that makes “humane” or “cruelty-free” claims, chances are the animal who helped make it is alive and well. Designation referring to for-profit companies meeting rigorous standards of social and environmental performance, accountability and transparency. The standards are set by B Lab, a Pennsylvania nonprofit founded in 2006. There are currently over 2,500 certified B Corps spanning 50-plus countries and 130-plus industries. Prominent B Corps in the outdoor industry include Cotopaxi, Patagonia, Kammok, Klean Kanteen and United By Blue. Overseen by a Swiss group, the bluesign® certification indicates a company’s entire textile supply chain meets stringent environmental standards. The system is based on five principles: resource productivity, consumer safety, water emissions, air emissions, and occupational health and safety. Because the textile industry puts an enormous amount of stress on the environment, the bluesign® badge carries more weight than other general certifications. A particularly nasty chemical linked to cancer, infertility, heart disease, birth defects and more used to make water bottles, food containers and other plastic products. Look for “BPA-free” and avoid products with the recycling numbers 3, 4 and 7, which indicate presence of BPA. The holy grail of sustainability. If an entity is carbon-negative, it’s going far beyond reducing its carbon footprint to zero—it’s actively removing carbon dioxide from the environment. Becoming carbon-negative requires proactive and prolonged efforts, such as planting trees or generating renewable energy. The only large-scale carbon-negative entity is Bhutan, a tiny kingdom in the Eastern Himalayas. A realistic goal all individuals, companies and countries should strive for. If an entity is carbon- neutral, its carbon footprint is zero and it’s neither adding nor removing carbon from the environment. To become carbon-neutral requires changing everyday habits and purchasing decisions and most importantly, an unshakeable belief we can affect positive change. Next time you tear a rain jacket or snap a tent pole, remember broken gear can almost always be easily and cheaply repaired. Patches look cool, stickers hide blemishes, and duct tape tells a story. Take care of your possessions and they’ll live longer. Any chemistry professor will tell you that everything in the universe is made of chemicals, including that organic kombucha you drank last week. “Chemical-free” sometimes means less scary lab-made chemicals you can’t pronounce, but for the most part, it’s a word without substance. An enormously complex U.S. law governing water pollution as of 1972—or 1948, depending who you’re asking—and one of the oldest, most important environmental laws in the country. Without it, companies could freely dump toxic waste into our oceans, lakes, rivers and streams just to save an extra buck. The defining issue of our time and an irrefutable truth many misinformed people are actively trying to challenge, i.e. the reason we’re publishing this article in the first place. A small household vessel speeding up the decomposition of organic matter. In go banana peels and compostable coffee cups, out comes nutritious soil for your plants. A way of life. Get to know the brands who make the things you buy. Do they align with your values? If not, don’t give them your money. If they do, give them your money, but only when necessary. Buy smarter and buy less. A group of over 200 companies using membership dues to fund grassroots environmental organizations, which was founded in 1989 by REI, Patagonia, The North Face and Kelty with an original mission to strengthen the bond between the outdoor industry and conservation. Today that relationship has never been stronger and has helped save 51 million acres of wilderness and 3,102 miles of rivers, purchased 13 climbing areas, designated five marine reserves, and stopped or removed 30 dams. A relatively new belief that for-profit companies must be a force for good. Many are finding that standing up for social and environmental causes builds customer loyalty and can increase profits. Patagonia is the best-known exemplar of this strategy. The outdoor industry’s favorite hydrophobic chemical is bad for the planet and also has a misleading name. It’s not really “durable” at all—crunching or scuffing DWR-treated fabric wears it out, meaning you have to spend more money every few months on Nikwax to keep your rain jacket or tent water-resistant. But the worst part? DWR contains nasty chemicals called perfluorinated compounds, which pollute ecosystems and wreak havoc on organisms for many, many years. Scraps that fall off the assembly line and are repurposed to make a product. Cotopaxi does this well and many more are following suit. Three words reaching far beyond your Whole Foods produce section. Any product deemed fair trade—a designation doled out by four nonprofit organizations like Fair Trade USA—places emphasis on economic well-being of the indigenous workers who helped make it. Companies selling fair trade goods pay producers a premium going directly to the workers and their communities. By purchasing fair-trade goods, you are saying hell no to reckless corporate profiteering and hell yes to basic human decency. Universal animal rights meant to protect all animals under human control, including: freedom from hunger and thirst; freedom from discomfort; freedom from pain, injury or disease; freedom from fear and distress; and freedom to express normal behavior. This is not an official certification or product label badge, but a simple and powerful belief influencing the decisions of individuals and companies all over the planet. An international organization promoting responsible management of the world’s forests. Every minute, about 36 football fields of trees are lost to deforestation and every day, 200,000 acres of rainforest, an area 14 times the size of Manhattan, is burned. An FSC-certified product follows 10 principles encompassing sustainable logging practices, workers’ rights, pollution control and more. An international ecological and social standard for the production of organic textiles. A product’s entire supply chain must conform to a long list of rules regarding the use of toxic bleaches, dyes and many other chemicals, as well as guidelines for workers’ rights. Among the world’s strictest industrial standards, it’s not to be confused with USDA Organic, a much weaker certification only concerning use of chemicals in agriculture. The shady practice of misleading consumers to believe something is “green” when it’s anything but. Most U.S. consumers are willing to pay more for a peaceful conscience and marketers know it. If a company can’t make genuine claims about a product’s greenness, it simply splashes the product with green paint and propaganda. Don’t be swindled. A miracle crop freely cultivated by humans for over 8,000 years until the 1930s, when some powerful assholes decided it posed a threat to their business empires and moved to outlaw industrial hemp production in the U.S where it remains federally illegal today. Industrial hemp has over 50,000 uses and is one of the most eco-friendly resources on the planet. A sacred doctrine followed by all faithful outdoorsmen and outdoors women. When visiting the world’s wild places, take nothing but photos and leave nothing but footprints. Show respect for nature and the other people who want to experience it. Anyone who ignores LNT is not a true outdoorsmen or outdoors woman. A four-rating system for the design, construction and operation of green buildings, homes, neighborhoods and cities: Certified (lowest), Silver, Gold and Platinum (highest). Compared to traditional structures, LEED structures use significantly less energy, have highly efficient water systems, let in tons of natural light and are built with sustainable, non-toxic materials. A tell-tale sign a product is well-made with durable materials. Whatever it is, you’ll probably enjoy it forever. That’s good news for your wallet and the planet. The responsible alternative to conventional cotton, one of the world’s most environmentally and socially destructive cash crops grown and processed using a staggering amount of chemicals, such as synthetic fertilizers, insecticides, fungicides, bleach, wax, sulfur and formaldehyde. The workers harvesting it are often completely unprotected by the most basic labor laws and it’s grown with colossal amounts of water. Organic cotton does none of that and costs a bit more upfront, but conventional cotton exacts a far greater toll on a lot more than just your wallet. A group of synthetic chemicals used to make materials resistant to stains, grease and water, they’re present in zillions of everyday products and are also persistent, meaning once they seep into the environment they can take several years to fully break down. Studies show PFCs have adverse effects on animals, including organ failure, immune disorder and birth defects. The jury is out on if PFCs harm humans, but their rap sheet doesn’t inspire confidence. A certification ensuring ethical treatment of geese and ducks worldwide. These birds supply the world with down and feather insulation, a task so enormous that farms, the overwhelming majority of which are in China, sometimes resort to inhumane shortcuts like live-plucking, force-feeding and concentrated cages. RDS applies to the entire supply chain, ensuring products are compliant from farm to store since it was started by The North Face in 2014 and subsequently adopted by hundreds of brands. The world uses 1 trillion plastic bags a year and less than 5 percent are recycled, the rest ending up disintegrating into tiny toxic globules penetrating our soil, becoming food for sea creatures, etc. So next time you’re asked, “Paper or plastic?” hopefully you’ll say, “Neither,” because you brought your own reusable bags. A supply chain whose raw materials, facilities, labor and more are, to some degree, open to public scrutiny. Not long ago, hardly anyone gave a damn about where cotton came from or how backpacks were made. That’s changing and companies are realizing if they don’t go transparent, curious consumers will crack open their supply chains. You have the technology to find out how a product is made and it’s called the Internet. If it takes more than a few minutes on a company’s website to discover where a product is from, they probably don’t have a transparent supply chain. Not to be confused with recycling, upcycling means using cheap, recycled materials to make a higher-quality products typically sold with a ridiculous mark-up. Think wine bottle chandeliers, vinyl record wall clocks and so on. You’ll be called a hipster, but your new garden trellis made with broken skateboards has tons of character and it’s good for the planet, too! Sorry to rain on your parade, vegans, but your prized faux leather is hiding some dark secrets. It’s most likely made from petroleum-based plastics like PVC (polyvinyl chloride) and polyurethane, both of which are excellent for screwing up the planet. Better to buy genuine, sustainable leather or buy no leather at all. This article was originally published in RANGE Magazine Issue Nine.